The Nisca PR-C101 (Item #PR-C101) single-sided printer is a reliable single-sided photo ID printer. 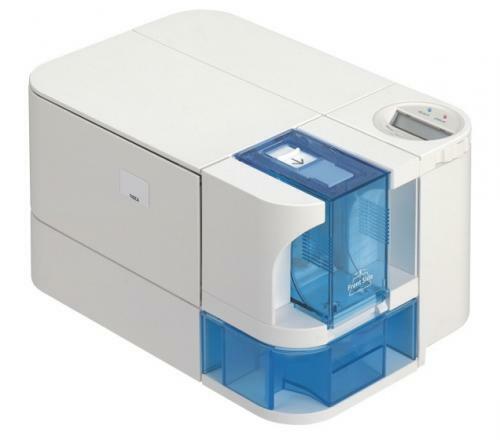 The Nisca PR-C101 single-sided printer is ideal for an organization that wants to print quality photo IDs on a budget. The Nisca PR-C101 comes ready to use right out of the box it includes an entry level badging application and enough ribbon and photo ID cards to print 25-photo IDs. The Nisca PR-C101 (Item #PR-C101) has a removable card feeder for 100 photo ID cards making the printing process easier and more efficient. The Nisca PR-C101 has the first ever LCD rotating panel to fit in any office environment. The Nisca PR-C101 prints the photo ID fast and it is Windows and Mac compatible making it compatible with almost every computer. The Nisca PR-C101 (Item #PR-C101) has brilliant 24-bit full color and 300 dpi edge-to-edge image. The PR-C101 single-sided printer provides a simple and affordable out of the box solution for high quality, high durability ID cards with low maintenance requirements. The printer is small enough to fit into an office overhead bin or under a counter. Offering the first ever-rotating LCD panel and optional front or back exit, the Nisca PR-C101 can be placed in any orientation to fit your office environment perfectly. The printer's ribbon cassette and cleaning assist roller unit is disposable. The Nisca PRC-C101 will come packaged with an entry level badging software application. Print Speed: YMCKO 134 cards per a hour. The Nisca PR-C101 Single Sided ID Card Printer features a 5-year warranty on printer and printhead.